Here's another set of picture books selected to fulfill these categories in the Picture Book Reading Challenge: #25 free choice (I Know a Lady), #35 a fairy tale (The Twelve Dancing Princesses), #49 a book published in the 2000s (If Not for the Cat), #64 a picture book biography (Planting the Trees of Kenya). I often associate James Stevenson with those wacky books about Grandpa and Uncle Wainey, so it was a surprise to see his softer side come out in his pictures for this Charlotte Zolotow book. The text describes a figure many children can recognize from their own neighborhoods: an old lady who lives alone and interacts with kids in various ways over the course of a year's holidays and celebrations. 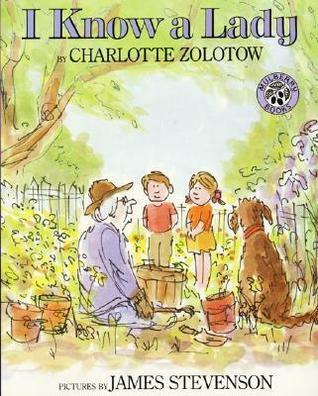 The text is spare, but the overall story is a poignant portrait of an inter-generational friendship that has made a strong impact on the young narrator. I'm not certain that kids can appreciate this book as well as adults, but I really loved it. I have never been much of a fairy tale reader, but Miss Muffet (3 years, 7 months) and I have both fallen in love with this picture book. For me, it's really the story that is intriguing. 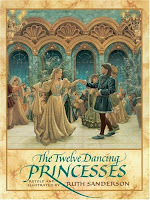 I like the element of mystery (why are the princesses' shoes worn out every morning?) and the fact that the underdog (Michael, the garden boy) becomes the hero. For Miss Muffet, I really think it's more about the illustrations, as she asks different questions each time we read it, and she seems completely engrossed by the pictures on each re-reading. If Not for the Cat is a book I discovered on Instagram, where a fellow Catholic mom and book lover said she thought my three-year-old might like it. It's a collection of haiku, each poem of which describes a specific animal depicted in the accompanying illustration. Miss Muffet did indeed enjoy naming each animal after I read the haiku, and she actually knew almost all of them, despite the fact that the poems don't name their subjects. 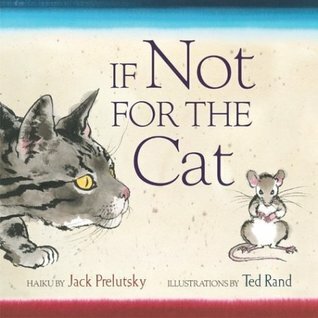 I thought the descriptions of each animal were wonderfully well-done, and I liked seeing a more serious side to the work of the often silly Prelutsky. My husband borrowed a few books illustrated by Claire Nivola from the library, and I liked the way they looked and read them as well. 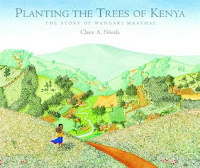 This is one of many picture book biographies of Wangari Maathai, who was a popular subject for early elementary school book reports when I was working in the library, but I found it more memorable and more beautifully illustrated than many of the others. I like the small details in Nivola's pictures and the fact that most of them are sweeping two-page spreads focused on a big picture, instead of on one small aspect of her subject. The text is straightforward and strictly factual, but there is a bit of playfulness and creative storytelling in the pictures that I enjoyed very much.